Find the location of a secret meeting place. Minister Ralden and Giron are missing. Advisor Varon believes that Giron is working with the Maulborn and has abducted Ralden. Solve the riddle and find the meeting place. Choose whether or not to aid the villagers. After speaking with Varon Davel and learning that a group of citizens may know the location of Giron Sadri and Councilor Ralden, find Slips-Through-Fingers just outside the kinhouse. She tells you that everything you need to know can be found in her backpack. Open the backpack to find a note containing a simple riddle, which directs you to look for a cat named Star nearby. Interact with Star to obtain the key to the Tedas House, and follow Star on a circuitous route through Narsis to the house. 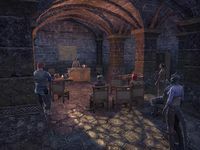 In the Tedas House basement, a secret meeting is being held by a group of agitated Narsis citizens who are fed up with House Hlaalu's mishandling of the crisis. Speak with Slips-Through-Fingers, who apologizes for the secrecy and asks you to tell Madras Tedas what you know about the disappearances and the Maulborn. At this point, you have a choice: help the villagers fight back against the Maulborn and rescue the victims at the risk losing the support of House Hlaalu, or refuse to involve the villagers further because of the danger involved and work on your own. The former leads to the quest A Timely Matter, in which you help arm the villagers, while the latter leads to the quest Ratting Them Out, in which you alert the guards to the villagers' plan. If you chose to help the villagers, the quest is completed and A Timely Matter begins. If you chose to not help the villagers, Rila Lenith is waiting outside. Rila has been passing information to Madras because her mother is among the missing. Madras knows where the missing people are being held, but he won't tell you their location. Rila rewards you for bringing her this information with some gold and Ratting Them Out begins. You don't have to follow Star, once you get the key from her you can head straight to Tedas House. Choosing whether or not to help Madras ultimately affects the outcome of Hiding in Plain Sight. If you choose to not help, then the villagers are broken up by the guards and never attack the Narsis Ruins where the Maulborn are holed up, but Councilor Ralden dies. If you choose to help, the armed but untrained villagers prove no match for the Maulborn and are killed in the ruins, but Madras finds Ralden and saves his life. Advisor Varon suggested I seek the assistance of a group of villagers who decided to find the missing people on their own. Slips-Through-Fingers, an Argonian, is apparently connected to the group. Slips-Through-Fingers dropped her pack and suggested there was something inside that would lead me to a secret meeting place. Slips-Through-Fingers claims to know where the missing villagers are. A note in her pack suggests that to find her, I need to follow the Star. I should keep my eyes open. A cat named Star is supposed to lead me to the secret meeting place. I need to follow the cat and see where she takes me. I discovered a group of villagers meeting in secret on the lower level of a locked building. One of them is Slips-Through-Fingers. I should speak to her and find out what's going on. I've been asked to help Slips-Through-Fingers and her friends. They want to rescue the abducted villagers, but they aren't soldiers. They have no idea what they're in for. Madras doesn't trust me yet, but I've decided to help him. I should speak to him again to find out what our next move is. I've decided not to aid Madras. He's just going to get his people killed. I should tell one of the guards about this before Madras and his group do something foolish. Finishes quest I found a guard outside. I explained what was going on. She doesn't want to see anyone get hurt, so she's devised a plan to disrupt the meeting. This page was last modified on 15 March 2019, at 20:53.